Sensei Jayson began his karate training with Sensei Rathe Mokelky. 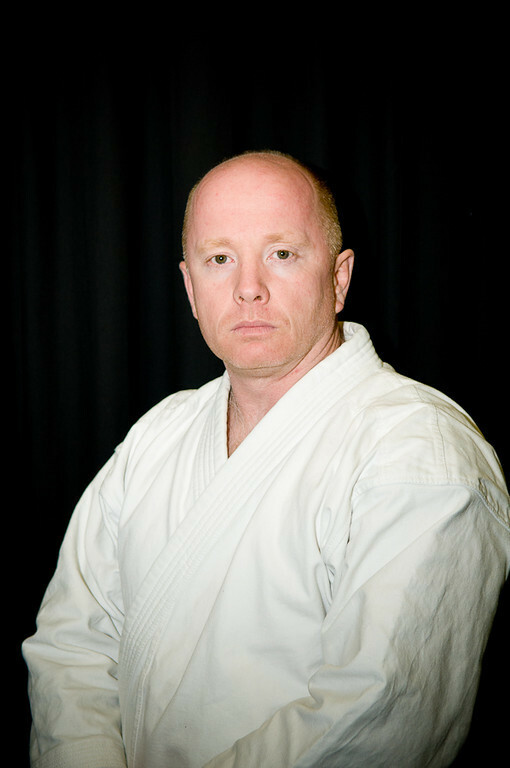 As Moose Mountain Wado Kai Karate’s chief instructor, Sensei Jayson brings a wealth of knowledge and skill to every workout. He strives to instill a strong sense of energy and realism in his students so that they are all well prepared whether it be for tournaments or self defense. His own intensity and willingness to share his knowledge make him an excellent motivator to all of his karateka. 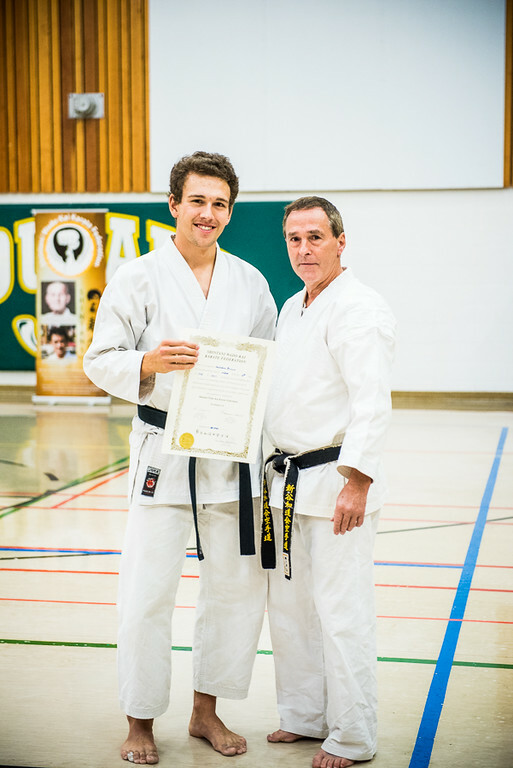 Sensei Kevin began karate at age 39 when his son wanted to try it. He was hooked after the first workout. While working out with Sensei Rathe sometime before his Green Belt grading, Sensei Rathe said, “Don’t treat a grading like just another workout. Treat every workout as if it were a grading.” That comment changed his whole approach to regular classes. For Sensei Kevin, karate has become more than a set of skills. It is a “way” of life. The martial arts have always been like this. We do not follow “The Way of Peace and Harmony” only in the dojo, but in our everyday lives as well. As one progresses through belt ranks, he/she gains an appreciation and acceptance of all people and a peace of mind through hard work and the understanding that the journey (way) is more important than the signposts (belt ranks) along the path. 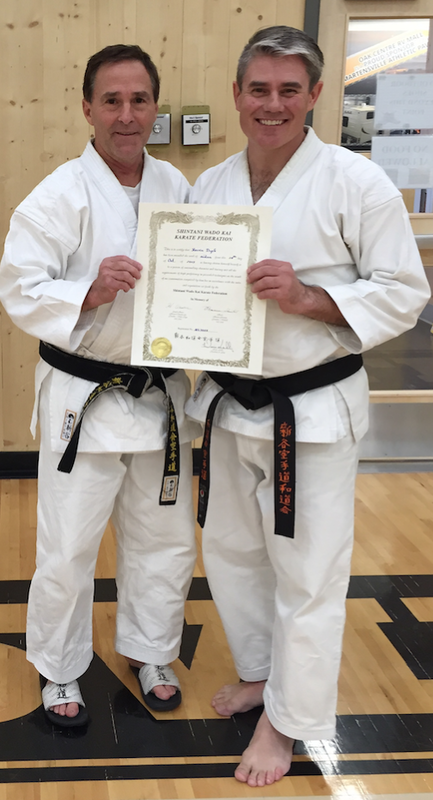 Sensei Kevin received his Shodan (1st degree) in 2012, and his Nidan (2nd degree) in October 2015. Bio coming soon bio coming soon Bio coming soon bio coming soon Bio coming soon bio coming soon Bio coming soon bio coming soon bio coming soon. Bio coming soon bio coming soon bio coming soon Bio coming soon bio coming soon bio coming soon. Bio coming soon bio coming soon bio coming soon. Bio coming soon bio coming soon bio coming soon. I started karate in 2010 with my oldest daughter. She stayed in it for two sessions, and when she decided to bow out, I decided to keep going. With major life changes in 2012, I ended up taking a year away from karate but convinced my two youngest to join up with me again in 2013 and my wife, Laurie, in 2015. After seven years dedicated to the Moose Mountain Karate club, multiple trips to tournaments, advanced clinics, one-on-one sessions, and a million questions, I achieved my Shodan (1st Degree). Karate is not just a sport, it is a set of ideals and a way of life. What I love about Karate is that it teaches discipline, peace, respect, resolve and humility in a profound way. Karate is rife with rite-of-passage, effort and accomplishment. It strengthens character, hones skill, and breeds confidence. One of the greatest lessons I have learned from Karate has been the ability to overcome adversity. From my clumsy white belt days to being beat up in my green belt grading by a 14 year old blue belt girl (now Sensei Marlee Cormier), to learning to not block with my face in my brown belt grading (thanks Sensei Quinn Brown), I have learned what it means to stand up in the face of adversity. In a world where failure is seemingly frowned upon, karate welcomes it and embraces the invaluable education only it can provide. Now 41 years old, I welcome the opportunity to share my experiences, both failures and successes, with the next generation of Karateka. And I am also excited about the vast amount I get to learn as I advance in dan (rank) as a black belt. When her girls were 8 & 10 her husband thought they should enroll them in karate. She suggested that would be a good thing for him and the girls, but she didn’t think karate was ‘her bag’ and she wasn’t interested. Around their 3rd class, she had to take them and she remembers Sensei Rathe Mokelky suggesting to her to kick off her shoes & socks and join in. Sensei Joan gratefully declined, sitting instead at the back of the Rec. Hall at Kenosee Lake. The next week, as luck would have it, she also had to chauffeur the girls and again Sensei Rathe invited her to join. She had coincidentally worn a pair of sweats and a t-shirt (just in case) and she remembers thinking that it did look like a really good workout…. that was 14 years ago. She has found Wado Kai Karate to be an excellent family sport – unlike any other – where adults and children start on the same playing field. She remembers one evening their 8 year old was trying to teach (now Sensei) Jason Duhaime – a mountain of a man – how to do Power Kata. Here is this little girl, the instructor and Jason, the adult, focusing intently on trying to learn the moves. It is so empowering for children. Many come in shy, bashful and timid and within weeks you can see such a positive change in their demeanor and confidence. Above anything else, that is what has kept her in karate – the influence Wado has had on her students. 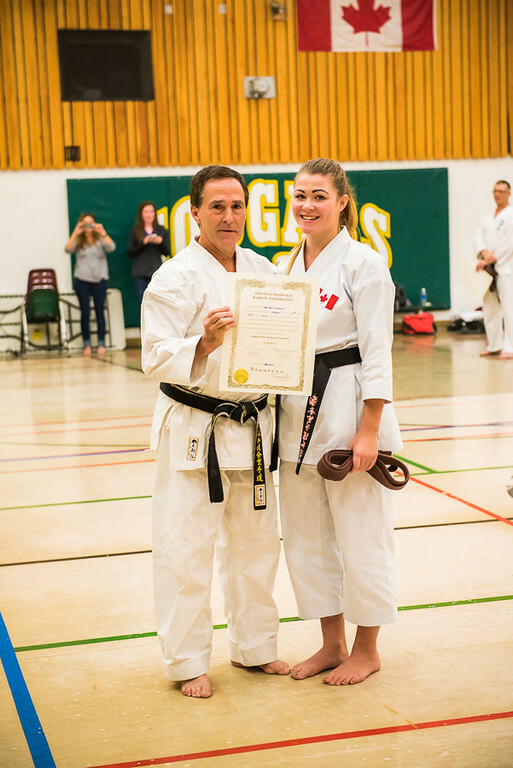 I have also met some fantastic people from all over western Canada – Sensei Rathe, Sensei Ron & Sensei Denis and she is very proud to call them her friends. She has the utmost respect for all of the black belts in our organization especially Sensei Jayson Humphries with whom she has gone through the ranks. When she is not involved with karate she has, for the past 22 years, worked for the Ministry of Tourism in the Moose Mountain Provincial Park. 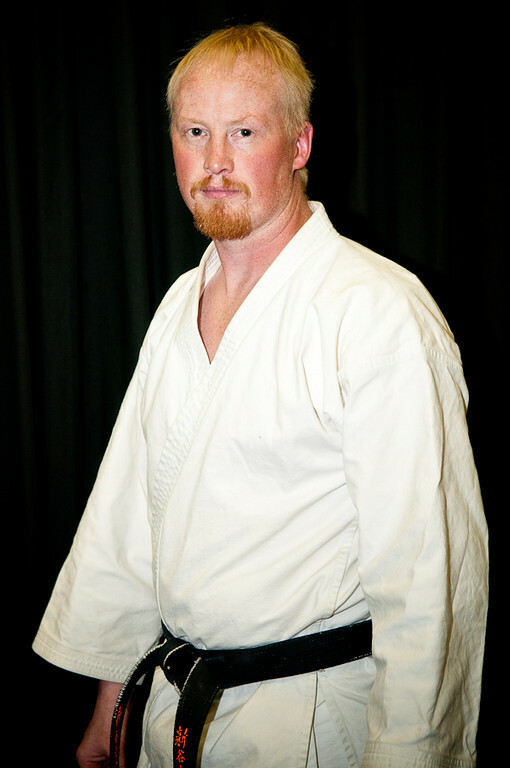 Sensei Shannon Klatt started karate in the fall of 1999, under the instruction of Sensei Rathe Mokelky. He also studied with Sensei Jeff Fenrick, Sensei Jane Laich, Sensei Mickey Adams, Sensei Joan Adams, Sensei Jayson Humphries, Sensei Doug Waldner, and Sensei Jeff Hirtle. He was graded to Shodan on October 28, 2006. 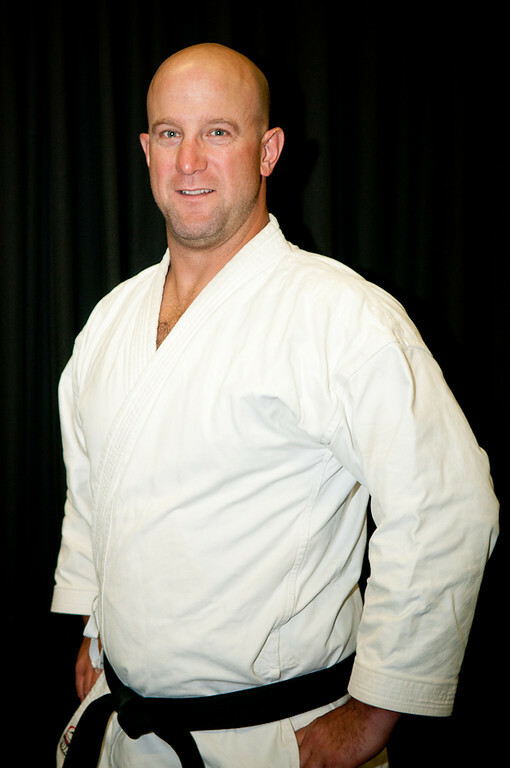 Shannon has spent his entire karate career with Moose Mountain Wado-Kai, where he now instructs. Sensei Jason started karate in the fall of 1997 shortly after his daughter Hannah was born. 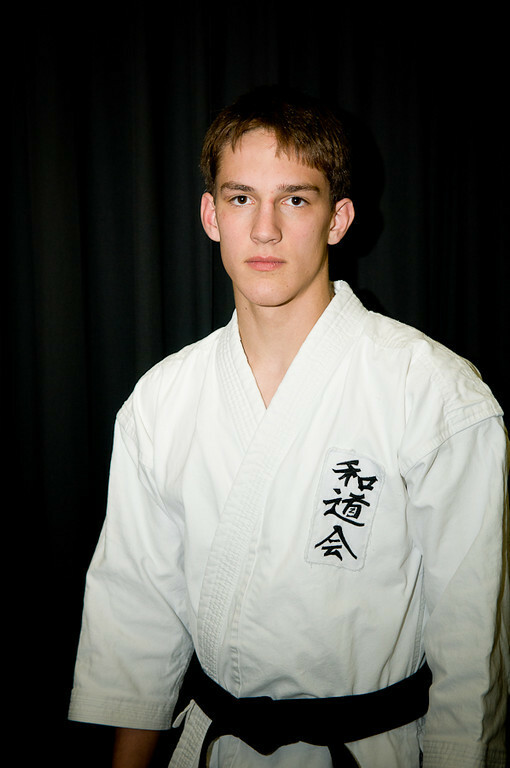 He had been in a Judo club for several years in his teenage years and always had loved fighting and the martial arts. He wanted his children to have what he believes are the demeanor and traits of a martial artist; determination, self-dicipline, motivation & confidence. He has seen numerous people, through the years, leave high school with high ranking belts in the karate club and nearly every one of them had these traits. They were successful people in their given fields and they never seemed to get into trouble through life. This was the driving force for him. If Sensei Jason was serious about karate, he believed his children would be as well. It took him a while to grade up to shodan, working in the oilfield he spent a lot of time away from home and the club. Sometimes years at a time not making it to a workout. But in September 2003 he was able to make it back to karate regularly as an orange belt. Sensei Jason was really into health & fitness by this time so karate was coming easier than it ever had before. He graded to Shodan in Virden, Manitoba in October 2006. Since then he has watched both his children begin making their way through the ranks and closing the gap to becoming black belts as well. They both understand what it is when he tells them never to quit something when they are passionate about it, both in and out of the dojo. Sensei Andrew Coffey started karate when he was 9 years old because he didn’t want to keep playing hockey anymore. When he first started karate his senseis were Sensei Jayson Humphries, Sensei Joan Adams and Sensei Jane Laich. Karate classes, at that time, were taking place at the town hall because the school gym was being used for classes due to renovations in the rest of the school. He received his black belt on February 6th, 2010 along with his fellow sensei, Sensei Kelsey. Karate is who he is. He hasn’t stayed with any other sport as long karate. He also practice Brazilian jiu-jitsu. Sensei Andrew has been training for three years and he is now a blue belt (which is one step up from white). Sensei Kelsey Drumm has been in Karate since the winter of 2000. 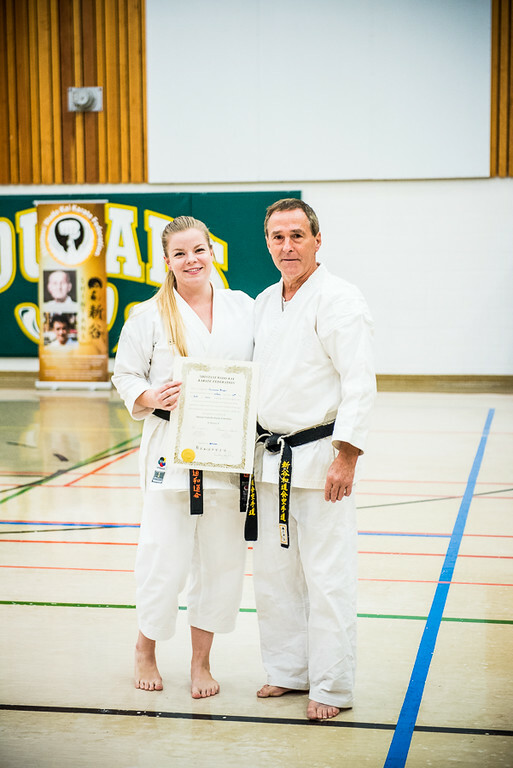 When she first started, she was taking classes in Kenosee Lake, SK, instructed by Sensei Mickey Adams and Sensei Joan Adams. Later on, she moved to the Carlyle dojo, instructed by Sensei Jayson Humphries, Sensei Joan Adams, and Sensei Jane Laich where she still practices her karate today. 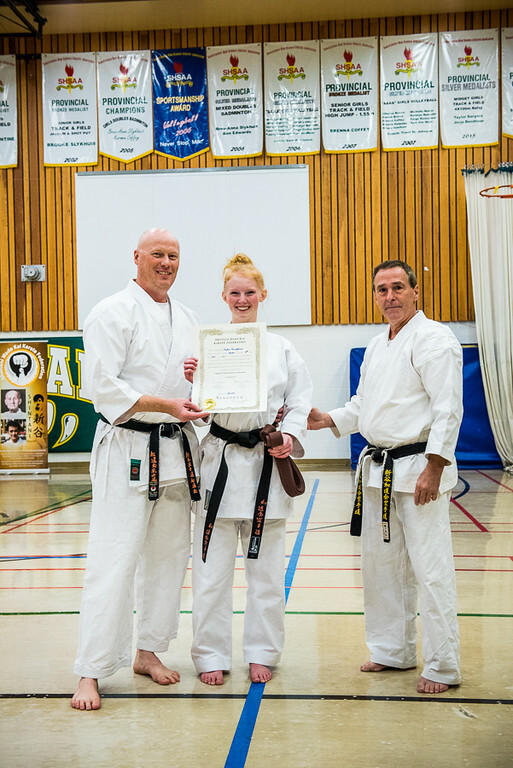 She was recently graded to Shodan with her fellow Sensei, Andrew Coffey. This will be Kelsey’s final year with the Moose Mountain club, she plans on furthering her Wado career when she moves to begin her post-secondary studies. 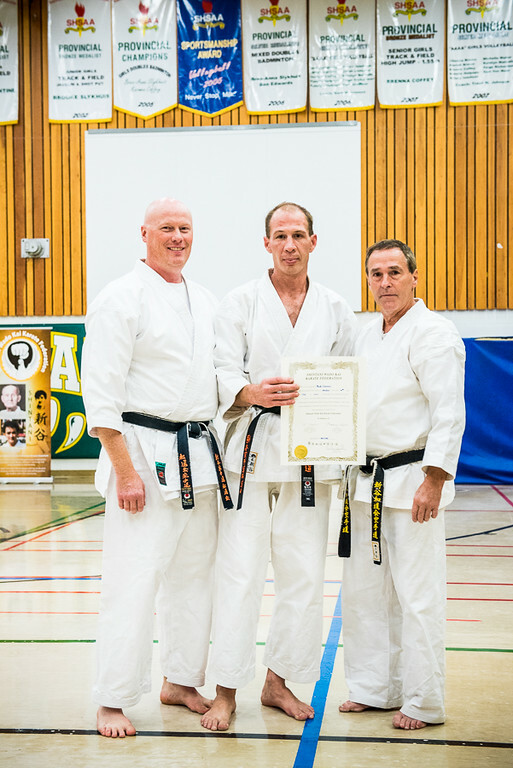 Sensei Doug Waldner began studying Wado Kai Karate in the fall of 1995, when his son, who is now Sensei Matt Waldner of the Saskatoon club, wanted to see what it was about. After watching one practice, Sensei Doug decided that he would not come to these practices and just sit on the sidelines. Sensei Doug studied under the instruction of Sensei Rathe Mokelki. Although Sensei Rathe was the primary instructor, others included Sensei Jeff Fenrick, Sensei Jeff Hirtle, Sensei Jane Laich, Sensei Mickey Adams, Sensei Joan Adams, and Sensei Jayson Humphries. 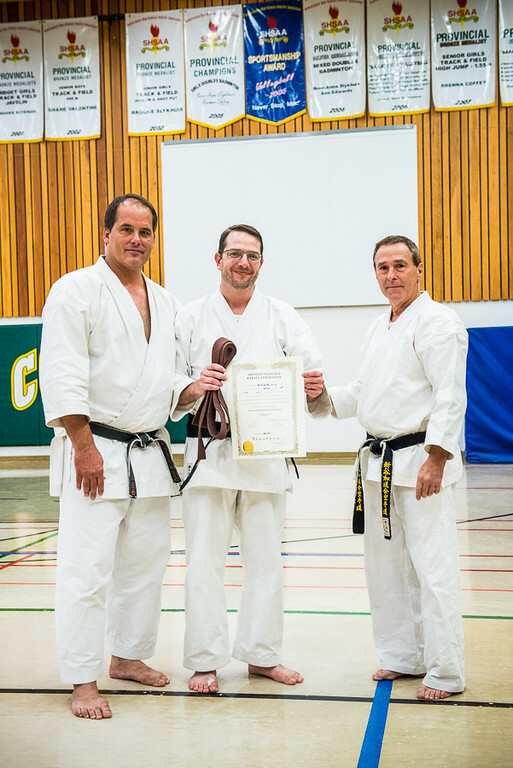 In October of 2003, at the Virden, Manitoba grading, Sensei Doug was awarded his Shodan ranking. Unfortunately, a chronic injury has kept Sensei Doug from the dojo in the last couple of years.